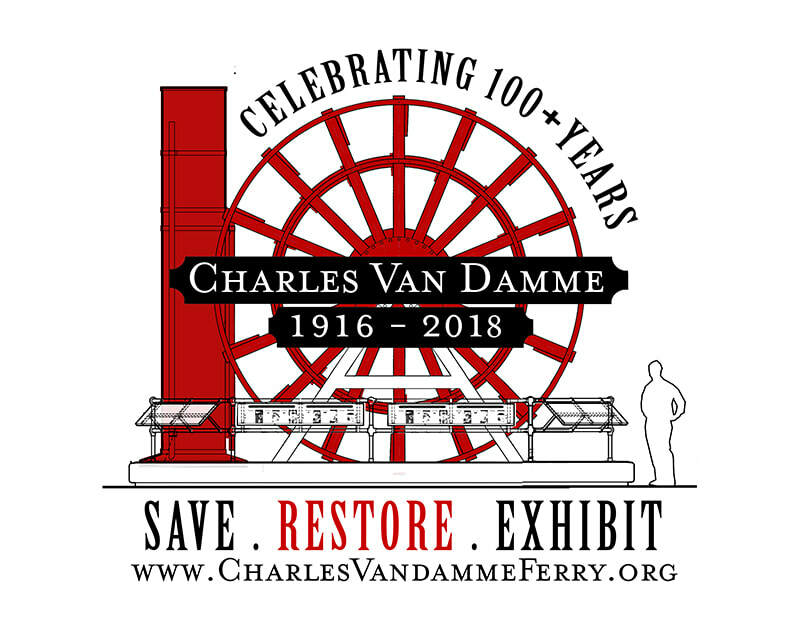 The Charles Van Damme Ferry Project's mission is to celebrate the lively history of the Sausalito waterfront by exhibiting the vessel’s original paddle wheel and the smokestack. This important permanent display will be located in the new Waldo Point Park, where the ferryboat last stood. The exhibit will serve as an educational and inspirational display of the rich maritime and artistic culture of Sausalito’s exuberant past. 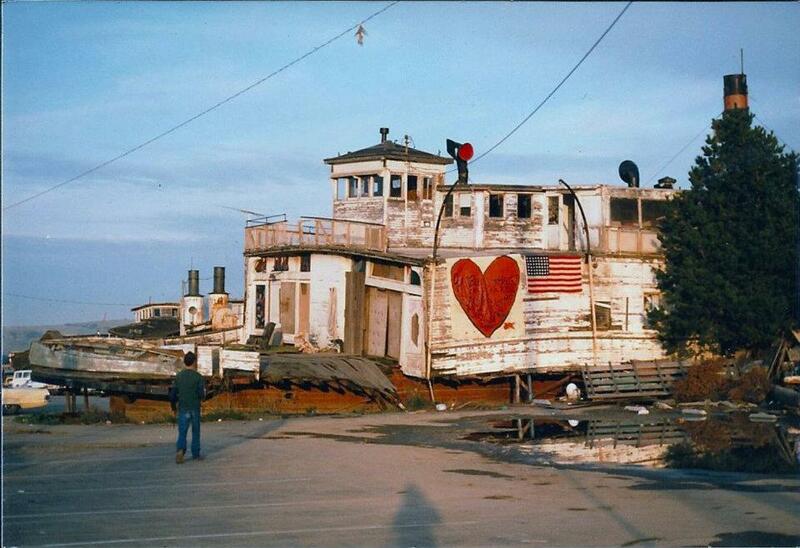 The Charles Van Damme Ferry has the distinction of being a unique axis for the San Francisco Bay's colorful history. 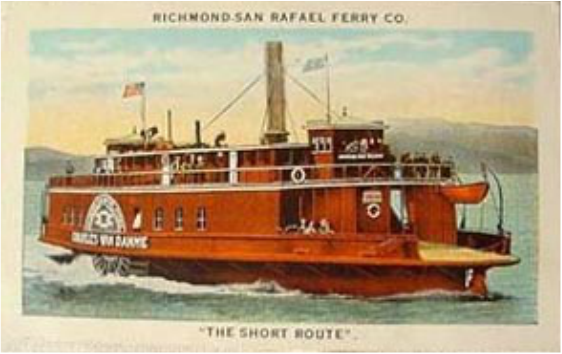 Built in 1916, she was a ferryboat for forty years, bringing passengers, cars, cattle, and provisions to many Bay Area communities. 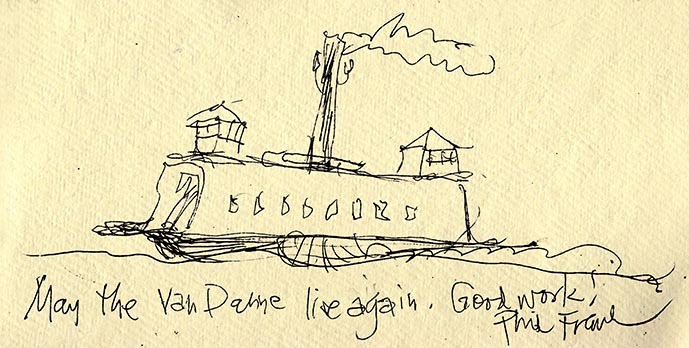 After her transport service ended, the Charles Van Damme continued in other storied incarnations, gathering together a whole new community that celebrated music, the visual arts -- and even fine food. For the past eleven years we have worked to revive her history by creating an educational display of her iconic paddlewheel and smokestack. We believe this project is vitally important to Sausalito’s ongoing effort to recognize the boat builders, seamen, artists, musicians, dancers, and craftspeople that worked on -- and lived on -- this great ship. ​We have secured and stored the wheel, stack and artifacts, we have a dedicated location, architectural plans and have acquired nearly all the permits required. Our committee of eight members meets regularly at the offices of Michael Rex, our architect. We have embarked on major a yearlong fundraising effort to fund the construction of the display. With the donation of your time, money, expertise and support we will succeed in saving, restoring and displaying a rare and important local maritime and cultural icon to inspire both present and future generations to come. ​We are welcoming support of any kind. ​Get a tax exempt certificate when you donate. CONNECT with us and let us tell you more about the project. SUPPORT by donating, time, money, materials or experience.